The ubiquity of digital platforms, spaces, and networks for writing in our current moment makes it difficult to imagine forms of publishing that exclusively circulate in print. 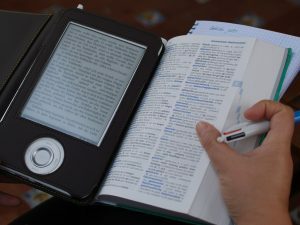 Yet, innovations in mobility, connectivity, and multimodality suggest that the effects of digital publishing are echoing deeply into our larger socio-technical systems. Among these effects are increases in networked participatory scholarship (Veletsianos & Kimmons, 2011), more visible and active self-publishing cultures (Laquintano, 2016), and significant shifts to the supply chains of the book publishing industry (Martin & Tian, 2010). Of course, the effects of digital publishing have also produced challenges for our institutions, especially regarding accessibility, ownership, and knowledge production. Libraries struggle to design consistent collection development protocols (Holley, 2015); university presses are pressured to revise outmoded peer-review systems (Fitzpatrick, 2011), and independent bookstores and DIY publications struggle to assert their counterpublic integrity in a virtual world. Above all, digital publishing has blurred the boundaries between writing and delivery, processes and products, and publicity and publication. This blog carnival seeks to respond to these effects and challenges by considering the past, present, and future of digital publishing both within and outside the computers and writing community. Historical inquiries that discuss digital publishing endeavors from the past, especially their networks, place in the “scriptural economy” (de Certeau, 1981; Gitelman, 2014), and gradual obsolescence. These may include Project Gutenberg, the Dynabook and Xerox Alto, CD-ROM technology, early PDAs, and of course Gophers, newsgroups, html, etc. Brief case studies regarding the forms and/or methodologies of particular projects, books, or dissertations in the digital humanities whose contributions to digital publishing are innovative, remarkable, or otherwise challenging the status quo. Reassessments on the future of the book, including innovations in playable books, self-publishing entrepreneurship, the rise of print on demand (POD), the politics of bookstores, and the rhetorical currency of print. Discussion of the perceived value or risks of publishing exclusively digital work (i.e., online-only journals) in comparison to more traditional, print-based forms of publication, especially in terms of their sustainability as new technologies inevitably emerge and dominate. Digital publishing interfaces or platforms, whose use by journalists, citizens, writers, or amateurs affects public rhetoric in significant ways. Edited video or audio interviews with editors of digital presses in composition and rhetoric about various aspects of digital publishing in academia. Ways of teaching digital publishing using web applications or spaces like Wikipedia, WordPress, Drupal, Issuu, Scalar, or other tools. Discussion of the role of university libraries and presses in distributing and preserving digital publications, including the challenges of collecting self-published e-books and the rising costs of subscription services (i.e. Elsevier). Arguments that make a case for what counts as digital publishing. For instance, is digital publishing only e-books and digital manuscripts, or do blogs, internet videos, and social media count in this conversation? Inquiries or case studies following whether (and when) digital publications count for tenure, promotion, dissertations, or other important graduate school or faculty promotion requirements. If you’re interested in contributing to this blog carnival, please send a short (100 words or less) proposal for your post to drcfellows@umich.edu. We will be accepting and publishing posts throughout November and December, so please send your descriptions as soon as possible, but no later than October 11. Full blog posts will be due approximately two weeks after your 100- word proposal is accepted. For more information, please contact: the Sweetland DRC fellows (drcfellows@umich.edu). Jason Luther is Assistant Professor of Writing Arts at Rowan University. His work focuses on zines, self-publishing histories, DIY culture, and multimodal (counter)publics.